The 2019 Motor State Challenge will once again see a division of the competition with two model year groupings – 1988 and Earlier and 1989 and Later and a third category “Touring Group” with no year boundaries. Manufacturers participating in the event will be competing in the “Manufacturer Category” and are not eligible for prizes and giveaways, however they will compete in the “Manufacturer’s Shootout” for the overall “Motor State Challenge Manufacturer Champion” trophies (Vintage and Late Model). Manufacturers will be assigned spots using the same criteria as all other competitors; therefore, they will be mixed within the established run groups. A “Manufacturer” is considered any competitor who designs, builds, and sells parts that enhance the performance and/or look of a vehicle. This includes, but is not limited to, all vendors selling products through Motor State Distributing. A “Manufacturer Vehicle” will be classified as any vehicle built and owned by the Manufacturer and driven by the Manufacturer, employee of the Manufacturer, or assigned driver of the Manufacturer. If the Manufacturer shares the vehicle with another driver, that vehicle will still stay classified as a “Manufacturer” vehicle. We will do our best to match participants in groups with like skill level and speed. GingerMan is a very open track with many safe run-off areas. It will still be stressed that you not let your speed exceed your skill level. 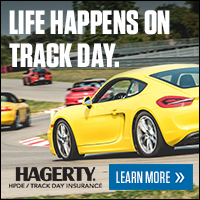 With proper spacing and passing procedures, everyone will enjoy a safe outing with plenty of track time. The GingerMan track day features road course hot laps without a speed regulating pace car. Timed sessions will be run for approximately 15 minutes each. Session duration is at the discretion of the SCCA race director. Since we're not limiting speed in the time trial groups, we will limit track time to prevent heat related malfunctions and failures such as brake fade and excessive oil/coolant temps. Road Course Timing – Competitors will be timed using AMB Transponders. If you do not have an AMB Transponder you will need to purchase one and have it mounted prior to the event. If you do not have your transponder prior to registering for the event, please remember to go back into your registration and add your transponder number once you have one. If you need a transponder for your car/truck feel free to contact us. We have them in stock along with the mounting clips. Optima Ultimate Street Car Open Event – In order to secure the OUSCI invite, the Spirit of the Event Award winner must compete in at least one of the OPTIMA Search for the Ultimate Street Car qualifying events during the calendar year in which the award was received. Official Rules and complete details on “The Optima Search for the Ultimate Street Car Open” are available by clicking on this link http://driveusca.com/. Click "Continue" below to see a detailed schedule of events and important safety requirements.